In their 28th season, Kitchen Dog Theater presents the National New Play Network Rolling World Premiere of “Wolf at the Door.” A dark fairy tale by Marisela Treviño Orta, the heroine (Isadora) stands up to her abusive husband when he forces pregnant Yolot to stay against her will. While he makes plans for the baby, the women devise one of their own. And as a pack of wolves closes in on the hacienda, Isadora must decide what price she’ll pay for her own freedom. KDT Co-Artistic Director Christopher Carlos directs this provocative fable about empowerment, which is part of Marisela’s cycle of fairy tale plays inspired by Latino folklore and mythology. A talented team has been assembled for this production. The cast will feature local luminaries Alejandra Flores (Isadora), Kristen Kelso (Yolot), Ruben Carrazana (Séptimo) and Dolores Godinez (Rocío). Godinez makes her return to Dallas stages since departing DFW in 2012. The show’s production staff is comprised of all KDT Artistic Company Members: Clare Floyd DeVries (Set Design), Linda Blase (Light Design), Korey Kent (Costume Design), John M. Flores (Sound Design), Cindy Ernst-Godinez (Prop Design) and Jeremy Escobar (Stage Manager and Technical Director). Originally from Lockhart, Texas, the playwright found her way to the genre while completing an MFA in Writing at the University of San Francisco (USF) where she studied poetry exclusively. While a student at USF, Marisela became the Resident Poet of El Teatro Jornalero!, a social justice theatre company comprised of Latinx immigrants. 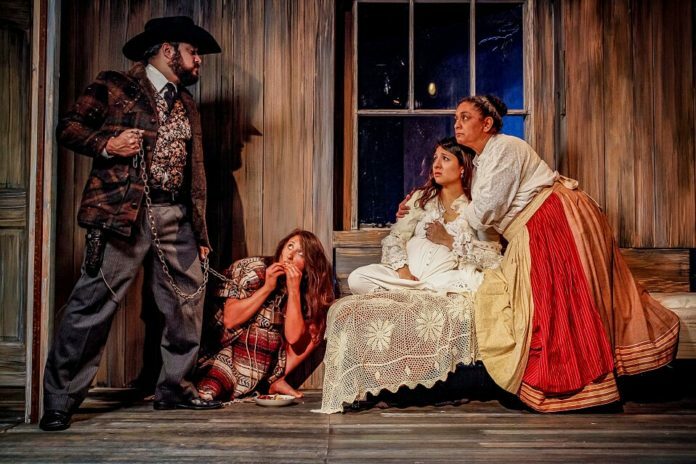 Marisela’s first play BRAIDED SORROW (2008 Su Teatro world premiere) won the 2006 Chicano/Latino Literary Prize in Drama and the 2009 Pen Center USA Literary Award in Drama. Other plays include: AMERICAN TRIAGE (2012 Repertorio Español Nuestras Voces Finalist); GHOST LIMB (2017 Brava Theatre world premiere); HEART SHAPED NEBULA (2015 Shotgun Players world premiere); SHOE (2019 Kendeda Finalist); RETURN TO SENDER (2019 Nashville Children’s Theatre world premiere); and WOMAN ON FIRE (2016 Camino Real Productions world premiere). In 2011, she began writing her cycle of grim Latinx fairy tales—fairy tales for adults inspired by Latinx mythology and folklore which include: THE RIVER BRIDE (2013 National Latino Playwriting Award Co-Winner, 2016 Oregon Shakespeare Festival world premiere); WOLF AT THE DOOR (2016 Kilroys List, 2018/2019 National New Play Network Rolling World Premiere); and ALCIRA. “Wolf at the Door” opens April 11 and runs through May 5 at Trinity River Arts Center, 2600 N. Stemmons Fwy, Ste#180 in Dallas. Ticket prices range from $30 for opening night, $20 -$30 for adults and $15 – $25 for STAGE, KERA/KXT, NNPN, TCG members, students and senior citizens/65+(all with proper ID). Performances are Thursday through Saturday evenings at 8 p.m., with additional performances on Sunday at 2 p.m. (4/14, 4/21, 4/28 and 5/5). This performance contains adult language and situations. KDT will host a benefit performance April 26 for Families to Freedom, whose mission is to transport victims of domestic abuse to safety. Ten dollars of every ticket sold to that performance will be donated to the nonprofit. There will also be a special panel discussion April 28 following the matinee. Entitled Domestic Abuse at Dallas’s Door, this discussion will center on the untold challenges of, and give practical advice regarding, escaping domestic abuse situations, from many perspectives. Panelists are TBA. For tickets, please call the Kitchen Dog Theater box office at 214-953-1055 or buy online at kitchendogtheater.org. This production is supported, in part, by the City of Dallas Office of Cultural Affairs, Communities Foundation of Texas, Moody Fund for the Arts, National Endowment for the Arts, The Shubert Foundation, Sullivan Perkins, TACA, Texas Commission on the Arts, and individual donors. Production event partners include: Goody Goody and Katy Trail Vodka.